Remember this: we'll never see the Peugeot 205 GTi 1.9's like again. 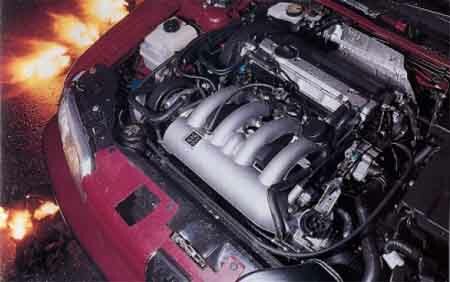 Regulations make it impossible to build a car as light as the 205. And some of the GTi's flaws and its bad manners in town would not be acceptable today. Nor could we now tolerate its patchy build quality and the inevitable rattles that came with miles and hard driving. so despite following in that car's footsteps, not to mention the 309 GTi and 106 XSi, the GTi-6 has a different set of priorities. Under its familiar bonnet, the new 306 GTi-6 gets an even hotter version of Peugeot's proven 16-valve 2.0-litre powerplant. It gets lighter internals, a new alloy cylinder head, harmonically optimised inlet and exhaust plumbing, along with Magneti Marelli's latest sequential ignition and twin-jet fuel-injection system. Power is up at 167bhp at 6500rpm and peak torque has increased by 10 per cent to 145lb ft - albeit 2000rpm higher at 5500rpm. To exploit this high-revving grunt, Peugeot's motorsport division has developed a six-speed gearbox - a first in the hot hatch class. For maximum fuel efficiency, top gear is significantly taller than in the five-speed S16, but the performance-biased lower rations are now much closer. Front struts and rear torsion-beam suspension is retained from the outgoing 306 S16. At last Peugeot has come up with a decent 16-valve engine. Past efforts from the PSA group have been less than marvellous. But it's not the engine that really makes this car, it's the gearbox. The gearchange is so precise and smooth that you find yourself changing gear for the hell of it. The 306 GTi-6 hits 60mph from rest in 7.8 sec, which, ironically, is the same time recorded by the 205 GTi. 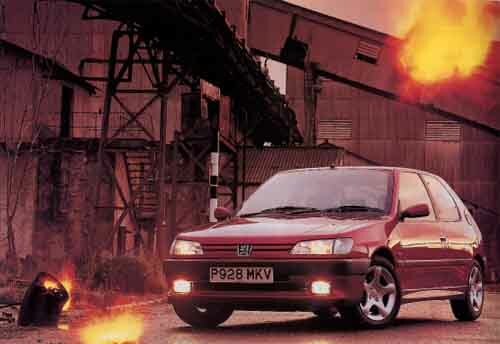 The 205 launched hard, whereas the 306's acceleration is more linear. The GTi-6 hits it's 129.9mph top speed in sixth gear, though it will also get there in fifth with the revs just stopping short of the 7250rpm cut-off. Chassis-wise, Peugeot has got the balance spot-on. The old 205 GTi provided an entertaining drive, but things could easily get fraught. The 306 GTi-6 will, if you are extreme with it, still launch into oversteer. We provoked it on the test track, but on the road you are unlikely to get the car to the point at which sudden lifting from the throttle will unsettle it into a slide. You can feel the passive rear-steer at work, helping the car turn in sharply. The GTi uses the S16's 3.2 turns lock-to-lock power-assisted-steering. Again, we had no gripes with that system, so all's well here. The GTi-6 is a discreet performer, with no aerofoil and no outrageous graphics. Just like the S16. 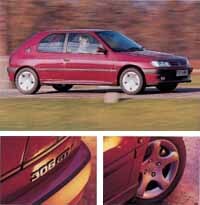 In fact, the only difference between the out-going hot Peugeot and the new arrival is a new alloy wheel design. That and the tasteful 6 badge on the tailgate. Bigger changes await inside. 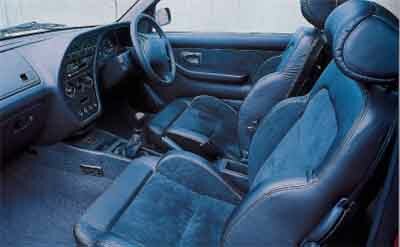 the GTi-6 comes standard with leather seats with great Alcantara suede inserts. Fubulous stuff, Alcantara: soft to the touch and expensive-looking. The front seats have generous wings to give support, and the suede does a fine job in stopping occupants sliding around during hectic cornering. A steering column adjustable for rake and seat height adjusters make finding a comfortable driving position easy. The free-revving engine and the sweet gearbox encourage you to use more revs and change gear more regularly, jsut for the fun of it. That said, we still average 25.1mpg indicating a 330-mile range from the 13.2 gallon fuel tank. Peugeot has always been boss of hot hatch handling, knowing just what the keen driver wants and providing it. Rivals have raised their game, although, and the latest GTi on the scene - Nissan's Almera GTi - is every bit as competent as the Peugeot. Fortunately for the French company, the Nissan looks uninspiring. The 306 is likely to grow old with grace, more timeless than extroverts such as Fiat's Brava. As we said earlier, it's fanciful and unrealistic to keep looking for the 205 GTi's successor, but the 306 GTi-6 is as near as anyone has got so far. Another great Peugeot hot hatch - one that's easily good enough to be rated alongside the 205 GTi. It knows just what keen drivers want, and provides it.